Hanoi (VNA) – The World Bank made public a report on improving Vietnam’s land transport and a strategy on sustainable development of inland waterway transport in the country at a workshop in Hanoi on March 28. Yin Yin Lam, a senior transport expert of the WB, said land transport is the backbone of the cargo transport system in Vietnam, citing figures that land transport accounts for 77 percent of total cargo transport in the country. 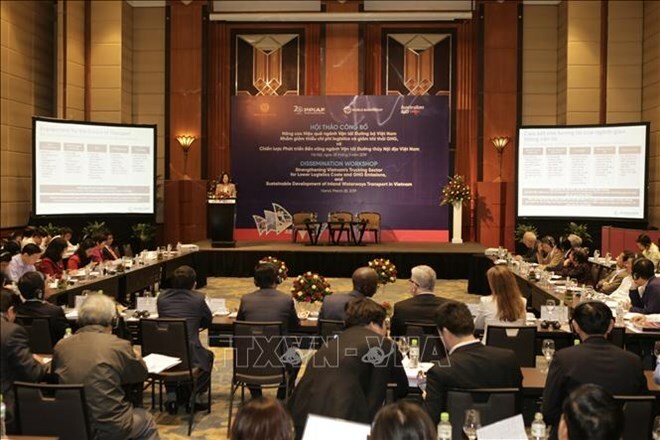 She noted that logistics costs in Vietnam made up nearly 21 percent of the national GDP, which is higher than the ratio in most other countries in the Association of Southeast Asian Nations (ASEAN). This affects the country’s competitiveness in export and increases costs for both producers and consumers, she said. While taking note of improvements in Vietnam’s logistics sector, as the country rose from the 64th place in 2016 to the 39th place in 2018 in the WB’s Logistics Performance Index, the expert said logistics costs remain high. In order to enhance the efficiency of land transport, Yin Yin Lam urged the country invest more in infrastructure to reduce traffic jams, promote the use of barge for container transport and further develop coastal shipping along the north-south route. The expert also urged transport firms to modernise their fleets and standardise the procedures for driver training and issuance of driving licences. According to the WB representative, the WB has committed 3.8 billion USD in total to Vietnam’s transport sector since 1993. The money was spent on building new roads, or to maintaining and upgrading existing routes. Regarding the inland waterway system, the WB expert said poor infrastructure has hindered the system’s development, such as ports with outdated facilities and poor connectivity with other modes of transport.